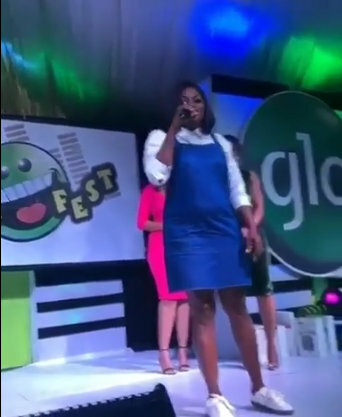 A while back, during the Hallelujah challenge that was led by gospel singer Nathaniel Bassey, Nollywood actress, Funke Akindele tapped into it asking for the fruit of the womb. Then word got out that she was pregnant. Her husband, JJC Skillz, maybe out of fear or for the sake of their privacy, denied the claims. Now it has been confirmed via this video that the Nollywood actress is pregnant. I seriously wish I had participated in the Hallelujah challenge. Anytime I stayed up, hot sleep will just come and blow into my eyes. Funny and sad thing is that I will wake up after the praise and worship session.....around 2 or there about. The days I managed to stay till the time, my internet service will suddenly become horrible. I seriously wish I had participated in it. Congrats to her again and her tap into her testimony of miracles.